Arsal is a village located in Lebanon – Baalbek – Beqaa governorate. Arsal is relatively isolated, it is 38 km away from the judicial center of Baalbek, 75 km away from the center of Beqaa governorate, and 122 km from Beirut. Arsal is 1400-2000 above sea level and is located in the eastern Lebanese mountain chain. Arsal has a 50 Km border line with Syria which is known for smuggling. Arsal provided Syrian refugees with shelter and aids after they were displaced from Al-Qalamoun and Homs. In the last few months, huge waves of refugees fled to Arsal. A squad from the Lebanese army, the eighth squad (airborne), raided a number of the refugee camps: (Al-Baraa, As-Sanabel, ECU, Azout, Flieta, and Al-Inmaa’ refugee camps). 450 Syrian refugees were arrested including children over accusations of terrorism. The two-stage campaign started on Friday 19 September, 2014 when approximately were arrested while the second stage begun on 25 September, 2014 where 200 refugees were arrested including 16 people who were under younger than 18-year-old. They were released gradually afterwards. There are 30 refugees who are still prisoners. Their fate is still unknown. Lebanese forces displaced the reamainig refugees from Al-Baraa’ camp, including children, women, and elders, and then burned all the tents which were more than 150 tents. SNHR affirms that most of the camp residents fled from the following towns in Al-Qalamoun (Yabroud, Al-Mashrfa, Ras Al-Ma’ra, Housh Arab, Qara, and Jrajier). The camp is located in Al-Jafar area behing Ras As-Saraj which is close to Al-Laboua Al-Hizbiya. 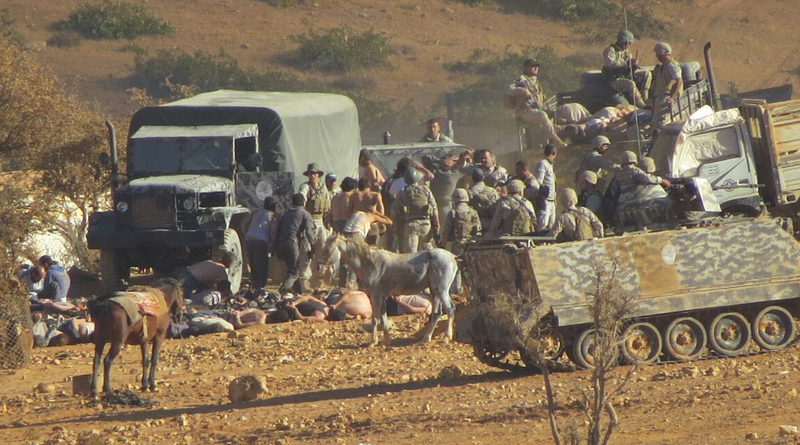 Some of the Lebanese squad personnel beat and insulted Syrian refugees in Al-Baraa camp. The squad didn’t only beat youngsters but also elders where it executed an injured man after he was beaten and insulted; Karam Abdulkarim Az-Zain, 60-year-old, from Damascus countryside – Al-Qalamoun, he was shot in front of a big crowd of arrested witnesses. The Lebanese forces kidnapped his corpse after killing him. This campaign was after an IED targeted a car for the Lebanese army in Arsal – Jaroud. The IED killed two serviceman and injured four others.